I saw the trailer for it there the other dag and surprisingly it looks good. Awesome movie! It's a beautiful movie with lots of action, humor, and music! A definite must see for anyone and everyone! YES!!!! tangled is the best movie ever!!! it is amazing. i have seen it twice within 18 hours. definetely worth seeing!!!! i really recommend it!!!!! it's funny, romantic, fun, exciting, and entertaining. please go support Disney fairy tales and go see Tangled!!!! Thanks when someone posts out this movie on YouTube I will check it out. ^^I wouldn't count on it being on youtube any time soon. Try megaupload in a dag of two, and it might be there. Gleek4ever is right. It is definitely worth seeing and has all of the classic Disney magic, as well as great songs (Menken's back!) and a lovely romance. If you're still wary, I'd suggest u see it in 2D instead of 3D, because the cost is lower. But the 3D is definitely worth it- I might see it again myself! 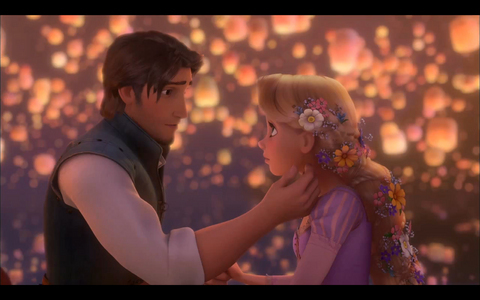 I want a Tangled 2!!!!! It Was Definetly A Movie Which I'll Keep Seeing Again And Again! Well, I'm not from the US but I've seen it and it's definitely worth watching. It's a beautiful movie. please dont get me started sweety! this is a outstanding movie!!!!!!!!! !i love the muziek and animation.like a almost pixar film.just right.the voices of rapunzel and flynn are two successful actors who have had thir share of big titles. it is a different aspect of disney fairytales.instead of the movie being all about trying to get to the kasteel on her being the princess it ends up being a journey of two unlikely peoplle who try chasing thier dreams.the muziek got an emmy nominee and made number 3 in the boxoffice. it is now on dvd so u can see for yourself how great it is!! I already saw it in the cinemas and I LOVED IT so DARN much I have to wait until the 21st of May to get my copy as its out the 20th in Ireland. Yes it's worth seeing.It's one of the best Disney films I seen in a long time! It's just so breathing taking from the start to the end.You should also see it in 3D it's makes even meer breathtaking! I seen the movie about 14 times in theater and I useuly don't do that but this movie was just so amazing that I had to see it again and again! Anyways just see it u won't be disappointed! Amazing IT IS NOT A RIP OFF!!!! I love it <3 !! I watched it a billion times! I love it!